Good morning Junkies! I've been working on journal pages lately and wanted to share this with you. Since it's beginning to turn cooler where I live, I was in the Fall mood and decided to focus on that. I started by filling in the background with a combination of Art Anthology Desire, Fiji, Tuxedo Velvet and Lemon Tart Velvet mixed with Splashed Sorbet, and using the Cracked and Dot Matrix stencils. Everything is just randomly applied. I then used the page to mop up some Wild Orchid and Juicy Colorations I had on my mat. 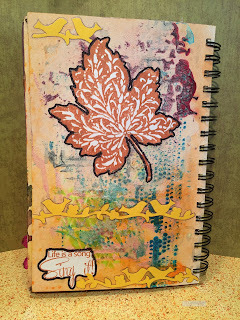 I then sprayed Rustic Colorations over the entire page and blotted. 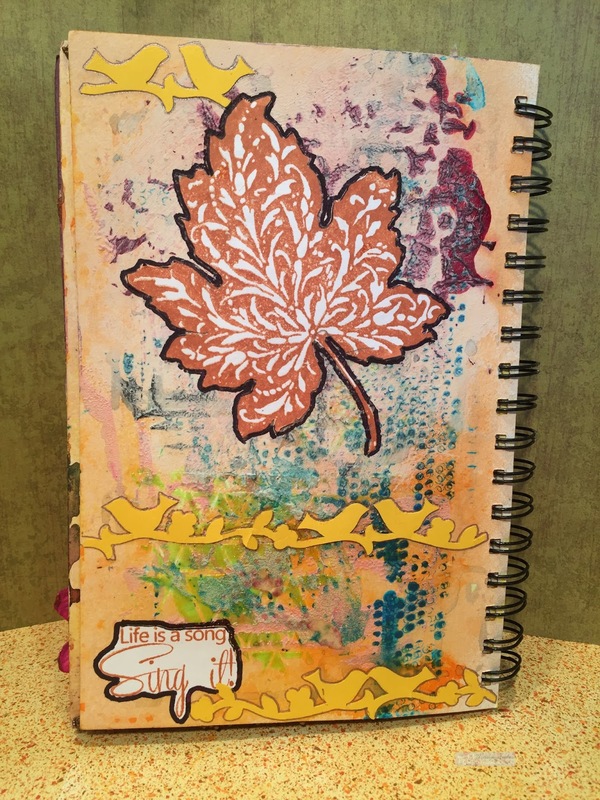 I stamped Big Ornamental Leaf with Orange Blossom ink, cut out, and adhered to my page. I then stamped Life is a Song in the same ink, cut it out, and adhered to my page. It was still looking kind of bare so playing off the sentiment, I used by Brother Scan N Cut to cut out some birds and blossoms and added that to my page. Here's to having a wonderful Fall!